Who invented Color TV? 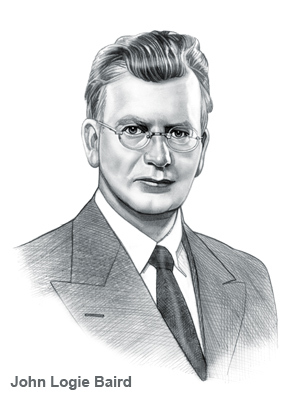 The name of the person credited with inventing the Television and Color TV is John Logie Baird (1888 - 1946). John Logie Baird is not only famous as the Scottish inventor of Color TV but also as a designer and engineer. When was Color TV invented? John Logie Baird invented Color TV in 1928, during the Interwar period of invention (1918 - 1939). Colour TV's first went on sale in the 1960's and 1970 was the first year that color television sales exceeded black and white television sales. Definition of Television: Television is defined as a telecommunication system that converts and transmits fixed or moving images of objects and sound by radio or other means into electrical signals between distant points which are then displayed electronically on a TV screen via a television set. The sound and images create television programs that people watch. Definition of Color TV: The Color TV is defined as a television that transmits images in colour. Fact 1: Who invented Color TV? The Color TV was invented by John Logie Baird in 1928 during the Interwar Era of inventions (1918 - 1939) following his pioneering work on the invention of the black and white TV. Fact 2: Who invented Color TV? Prior to the invention of Color TV in 1928, the television had been invented by John Logie Baird in 1926 but was only able to display black and white images. Fact 3: Who invented Color TV? The inventor of the television and Color TV, John Logie Baird, was born on August 14, 1888 in Helensburgh, Argyll and Bute, Scotland, UK and died on June 14, 1946. Fact 5: Who invented Color TV? John Logie Baird invented the black and white TV in 1926 by developing a way to capture objects in motion. In just two years he developed his invention further to transmit color images. At this time in history most people listened to the radio or went to the movies for their entertainment. Fact 6: Who invented Color TV? In 1927 John Logie Baird sent a long-distance TV signal over the 438 miles from London to Glasgow through the phone line. His invention caused a sensation and the race to to make a rival electronic television system began. The names of prominent pioneers of television were Philo Farnsworth, Lee De Forest, Manfred von Ardenne and Vladimir Zworykin. Major companies such as Westinghouse Electric, RCA and Marconi-EMI also joined the race. Fact 7: Who invented Color TV? The first long distance television public tests in America ran in 1925 between Washington D.C. and New York and the first TV station, owned by Charles Jenkins, was established in 1928 and named W3XK. Fact 8: Who invented Color TV? John Logie Baird continued to develop his own ideas and developed a system to transmit colored images using scanning discs, spirals of apertures, filters of a different primary color and three light sources. Fact 9: Who invented Color TV? On July 3, 1928 John Logie Baird introduced color TV. The first color TV images were of flowers, strawberries, and a man in a red and white scarf. Fact 10: Who invented Color TV? The concept of Color TV was in its infancy and although Color TV was invented by John Logie Baird in 1928 it took nearly 40 years before color television was made available to the public. During this time the movies retained the monopoly on color moving images. Fact 11: Who invented Color TV? The reach of television broadcasts were extremely limited and the price of televisions were extremely expensive and by 1936 there were only 200 television sets in use - all were black and white. Fact 12: Who invented Color TV? John Logie Baird continued to experiment with his invention of the Color TV and on February 4, 1938 made the world's first color broadcast in London. Fact 13: Who invented Color TV? John Logie Baird was issued with British patent number 562,168 on July 25, 1942 for the Baird Color Tube - it was the first all electronic colour tube in the history of television. Fact 14: Who invented Color TV? John Logie Baird began work on the first all-electronic single-tube colour TV system he called "Telechrome" and on August 16, 1944 Baird demonstrated the world's first fully electronic color television. Fact 15: Who invented Color TV? His invention used two-colour TV that used two primary colours and he was working on converting the two-color system to three-color RGB (Red, Green, Blue) when the great inventor John Logie Baird sadly passed away. Fact 16: Who invented Color TV? John Logie Baird died on June 14, 1946 at Bexhill, near Hastings in Sussex of pneumonia. His name will always be associated with the invention of television and Color TV. Fact 17: Who invented Color TV? The development of Color TV continued and CBS pioneered a television system which transmitted an image in each of the three primary colors (RGB) sequentially. The first colour television sets for this system were sold in 1954. They had 15 inch screens but by 1955 all color television sets were made with a 21 inch picture tube. Fact 18: Who invented Color TV? RCA demonstrated its “all-electronic” colour system for the first time on October 9th, 1951. Fact 19: Who invented Color TV? Color TV's were extremely expensive and by 1957 only 150,000 colour TV sets had been sold. Fact 20: Who invented Color TV? The early 1960's proved to be the turning point as the new televisions became more reliable and less expensive and television companies provided more programs in colour. Fact 21: Who invented Color TV? 1970 was the first year that sales of colour TV sets exceeded sales of black and white televisions. Fact 22: Who invented Color TV? Today, approximately 95% of all homes in the United States have color TV.